Top Three Therapeutic Areas: Success Assessment by Disease and Sponsor. 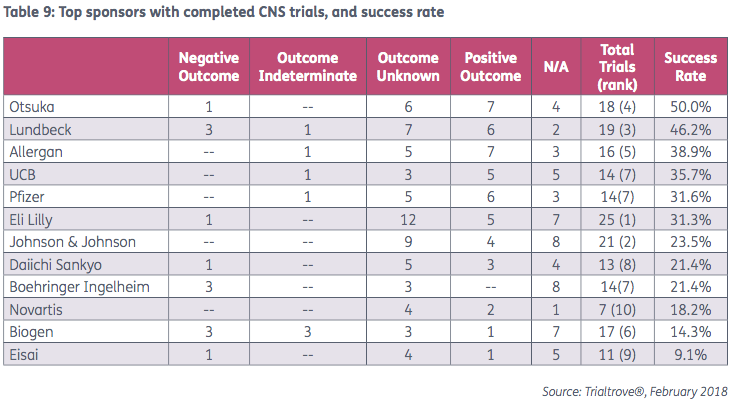 Across the nine therapeutic areas (TAs) included in Trialtrove, the rank order with respect to numbers of completed trials remained unchanged between 2016 and 2017 (Table 1). The top three TAs remain Oncology, Autoimmune/Inflammation (A/I), and CNS. In terms of absolute numbers, just over 80 more oncology trials completed in 2017 compared to 2016. The other TAs with more trials in 2017 include CNS, Cardiovascular, Vaccines, Ophthalmology, and Genitourinary. Within each TA, Table 2 compares the top 10 diseases with completed trials in 2017 with the prior three years. The sum of trials for these diseases was highest in 2017, and apart from trials assessing efficacy in hepatitis C virus (HCV), the absolute numbers of trials for 2017 were close to, or exceeded the 2016 counts. 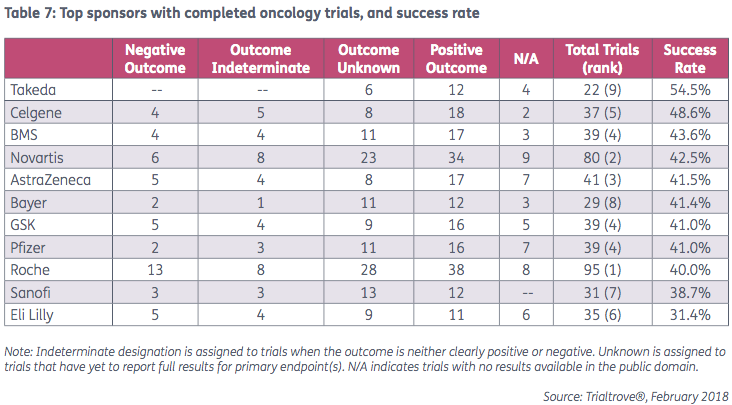 The diseases with 25 or more trials that attained primary outcome(s) were led by breast cancer, with a total of 58 trials, which accounted for 34.7% of all completed trials (Table 3). The top-ranked disease, multiple myeloma, had 26 of its 45 trials hit endpoint. Three sponsors completed over 70 trials in 2017. The top five sponsors (Table 4) showed some movement compared to the prior three years, with Roche moving to the top of the leaderboard, Merck & Co slipping to seventh place, and AstraZeneca emerging into the top five rankings. The more telling metric is that of the top sponsors whose trials hit their primary endpoint(s). 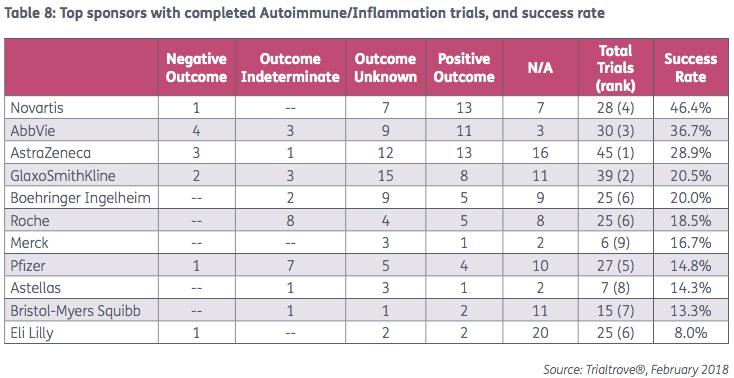 For those sponsors with more than 70 completed trials (Table 5), the overall success rates varied between a low of 15% (Boehringer Ingelheim [BI]) to a high of 40% (Novartis). Nearly 90% of the completed industry-sponsored trials involved only a single top 20 pharma (by pharma sales) or a single other pharma company (all other pharma [AOP]). Fewer than 4% of the trials involved two top 20 sponsors, and only 3% of trials were powered by two AOP sponsors. A total of 420 trials had some combination of co-sponsors (Table 6). were breast cancer (58), colorectal cancer (44), NSCLC (43), non-Hodgkin’s lymphoma (NHL; 36), and melanoma (31) (data not shown). 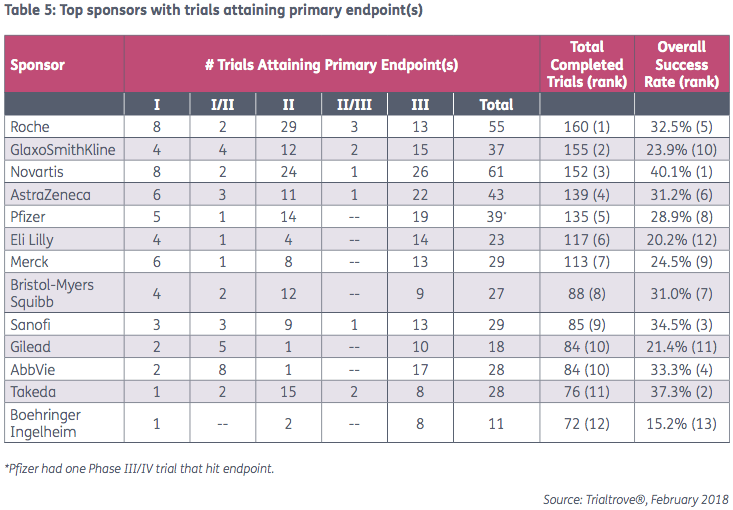 Roche and Novartis outpaced all other sponsors, with 38 and 34 trials hitting endpoints, respectively. Besides these top two sponsors, those with 10 or more trials that attained primary endpoints included AstraZeneca, GlaxoSmithKline (GSK), Pfizer, BMS, and Celgene (Table 7). Relative success rates, however, reveal that Takeda and Celgene were the top performers last year. AstraZeneca completed the largest numbers of trials last year, but ranked third by the metric of success. As observed for the Oncology area, rank by volume differs from rank by success rate (Table 8). 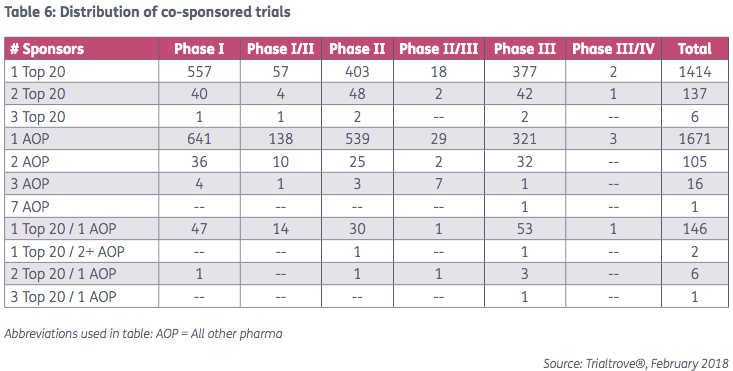 Eli Lilly topped the sponsors with 25 completed trials, followed by Johnson & Johnson (J&J) with 21, and Lundbeck (19) (Table 9). Otsuka’s 18 completed trials had the highest overall success rate – 50.0%. Sponsors saw slightly lower success rates in 2017 compared to 2016. 2016’s leading company Novo Nordisk had a 46% success rate. By comparison, 2017’s leading company Novartis had a success rate of 40.1% (Table 5). 16 pharma sponsors had 25% or higher success rates in 2016, compared to eight in 2017. Trying to assign any reason for this decline, other than slow trial outcome reporting, would be highly speculative.